Happy International Women’s Day! Today and every day, let’s Balance for Better. That’s the theme of 2019’s IWD, but it should be something we strive for year-round, every year. Let’s challenge gender stereotypes and bias. Let’s insist on gender parity. Let’s lift women up and celebrate women’s achievements. A very specific thing you can do to help celebrate and support women is to shop at female owned or co-owned Edmonton and area businesses. And you can use this guide to help you do just that! As I developed the first iteration of the guide, with the help of my supportive, also female friend Diane Lee (@argenplath), I was blown away but how easy it was to come up with a list of businesses—in a range of industries—that were being led by women in the Edmonton area. This is so exciting. What started as wanting to do a few shout-outs on my Instagram account has turned into a pretty solid directory. Please note: I am in no way suggesting you don’t shop or support businesses that aren’t led by women. Absolutely support any and all businesses that sell what you’re looking for, provide great products, service and customer service, and whose values align with your own, regardless of whether they’re owned by women or not. But if your’e specifically looking for a way to find, celebrate, and support female entrepreneurs and business owners in the Edmonton area, particularly on International Women’s Day, or any day, you can use this guide to help you identify where some of those places might be. Note: This list as an ever-changing resource! As I discover more businesses run by women in the area, I’ll update this directory. If you send me your suggestions on local, female entrepreneurs and business owners you think should be added to the list, I’ll add them. If YOU are a woman with a business in the Edmonton area and want to be on this list, please let me know! Either message me via email or on my social media. And if I got something wrong and a business listed is not owned or co-owned by a business, let me know that too. It’s an ever-changing resource. 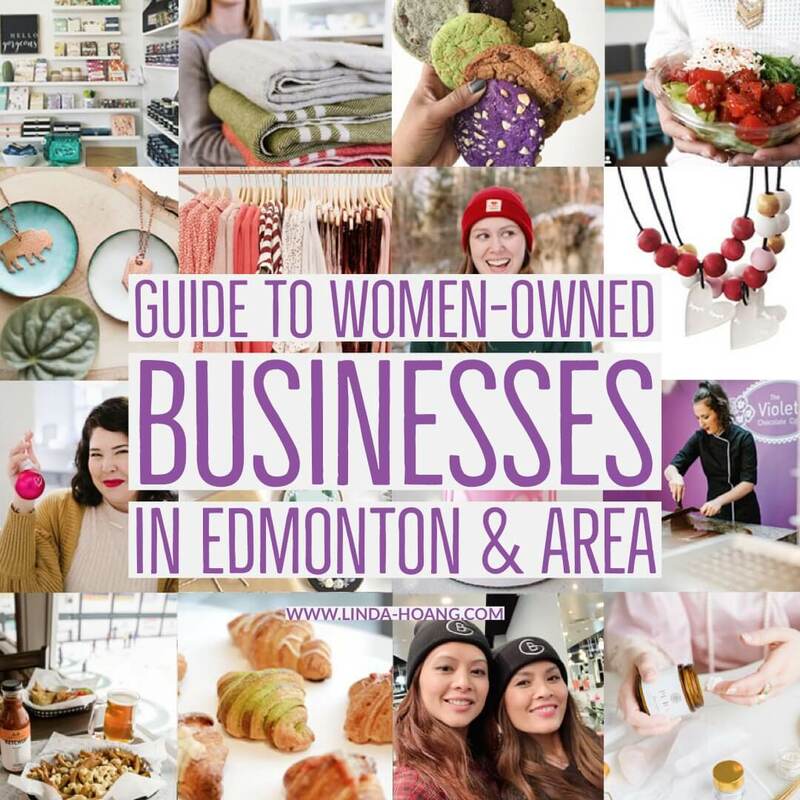 Guide to Women-Owned Edmonton (and Area) Businesses! The businesses listed below are either fully owned or co-owned by a woman. ALSO: while I can personally vouch for a large chunk of the businesses in the directory, I have not shopped or used the services for each and every one of them so please do your research before choosing to visit, buy or hire anyone in the guide below! Originally posted on International Women’s Day March 8, 2019. Last updated on March 13, 2019. Entries listed in alphabetical order per category. Literally, there are so many more women-owned businesses and entrepreneurs in the Edmonton area than what’s listed here, I know that. And I can’t wait to see how big this directory grows! As I mentioned, I’ll be updating this guide as I discover more women-led businesses and Ii you send me your suggestions on local, female entrepreneurs and business owners you think should be added to the list, I’ll add them too. If YOU are a woman with a business in the Edmonton area and want to be on this list, please let me know! Either message me via email or on my social media. And if I got something wrong and a business listed is not owned or co-owned by a business, let me know that too. Remember, it’s an ever-changing resource. Happy International Women’s Day and be sure to share this post and support women not only today, but EVERY DAY! Pin + share my Guide to Women-owned Edmonton and area businesses! Big omission is Gravity Pope. A woman-owned store that has been around for more than 25 years; a trailblazing business in this city with international recognition. Thanks, Linda. The Artworks is another big omission given its history and influence in the city. Other long-standing businesses I think of that I’m positive are women-owned or co-owned are Blue Plate Diner, Swish, Mousey Brown’s. It would also be interesting to know how many businesses are actually co-owned by couples, but the public face is only the husband. And don’t forget Kathy Sharp of Maven & Grace and Mill Creek Picture Framing. And Juanita at Color de Vino! Don’t forget all the handcrafted markets that are run & organized by women! On the Spot/Etsy Made in Canada, hello local market, Curated, The Fibre Shindig, Wholly Handmade, Hand2Hand, The Witchery Market, and Make It for sure! And everything YEG Boss Babes does (obvi)!